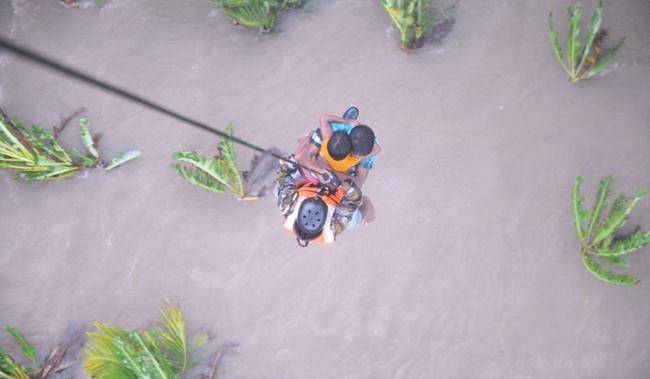 Sri Lanka Air Force personnel rescued a group of eight trapped in the Thabbowa area and sent them to the safe locations yesterday evening, Sri Lanka Air Force Media Spokesman Group Captain Chandima Alwis said. Puttalam District Secretary N.H.M. Chithrananda said 220 individuals belonging to 68 families of the Thabbowa Number 1 village were trapped due to heavy floods. 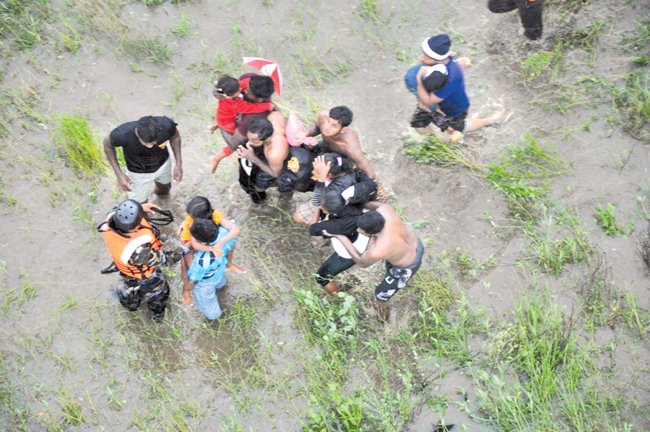 The special rescue teams of the Sri Lanka Army, Navy and Air Force were deployed in the rescue operations to move the persons trapped in the Thabbowa area by the floods to safety. The Navy dispatched boats to the location and the Army and Air Force have already dispatched helicopters and several other aircraft for rescue operations. The SLAF deployed MI 7, Bell 212 and Bell 412 helicopters in the rescue operations and SLAF Fire Fighters and regimental special force personnel and several rescue teams comprising SLAF Officers and Airmen in the SLAF Base Anuradhapura, SLAF Base Hingurakgoda, SLAF Base Ratmalana and SLAF station point Palaly are on stand by to take part in the rescue and relief operations. In addition, the Navy deployed a special group of six divers. The helicopters and other aircraft are unable to land and rescue efforts were hampered due to bad weather, they added. 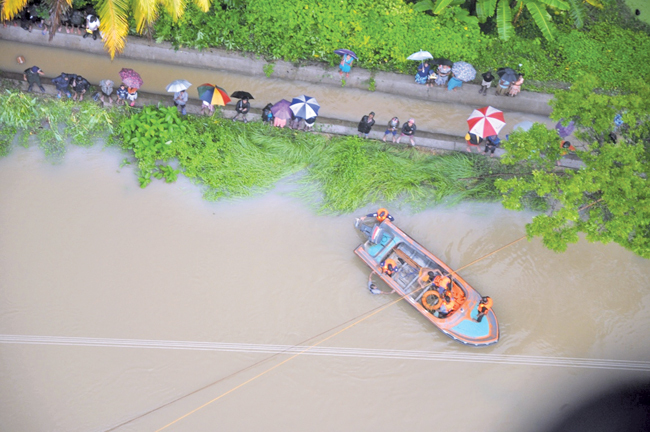 Meanwhile, Navy Spokesman Captain Akram Alavi said the Air Force together with the Navy embarked on a rescue mission at Tabbowa, Puttalam yesterday to rescue over 200 people stranded due to the floods. Speaking to the Daily News, he said Disaster Management Centre (DMC) officials requested the Navy to aid them in their operations. Two Naval teams consisting of six to seven personnel each were deployed to Tabbowa. Captain Alavi added that even though the DMC had warned the public in the area to evacuate on Monday evening, they had refused to do so. Given the rough water currents and inaccessibility in the area, the Air Force was also sent to rescue people in the area. Group Captain Alwis said they had dispatched one MI 17 helicopter from Pallavi at 1.00 p.m. yesterday to the affected area. They has rescued eight people trapped in the flood affected areas. The Irrigation Department had opened four gates of the Tabbowa tank on Monday at two feet each. Irrigation Department sources said 15 spill gates of Tabbowa Wewa and 27 sluice gates of Rajanganaya reservoir have already been opened. In addition, two sluice gates of Maha Wewa were also opened. Nuwara Wewa, Tissa Wewa and Basawakkulama Wewa were about to spill. Naval personnel rescued 633 civilians and transferred 188 distressed persons to safe locations. The bodies of two persons who drowned in flood waters in Mampuri and Wariyapola were also recovered by the Navy. Another 41 more relief teams are kept on standby covering all the Naval Commands to meet any emergency situation.